...and nice guy + gadget geek, some might add. Well, those are some of the better things Rob has been called. 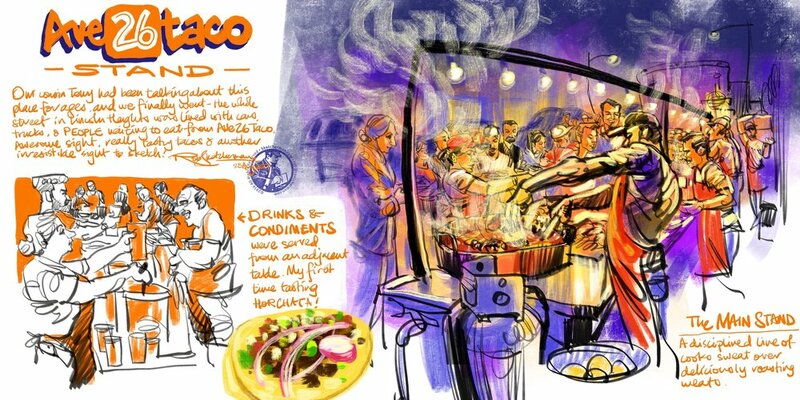 Making art on location on his iPad Pro, also known as urban sketching, is what he is most known for, and is what he loves doing whenever possible. There's nothing like the alchemy of being in one spot, absorbing the details of what's happening around him, then capturing the essence of what he sees and feels on his (digital) canvas. 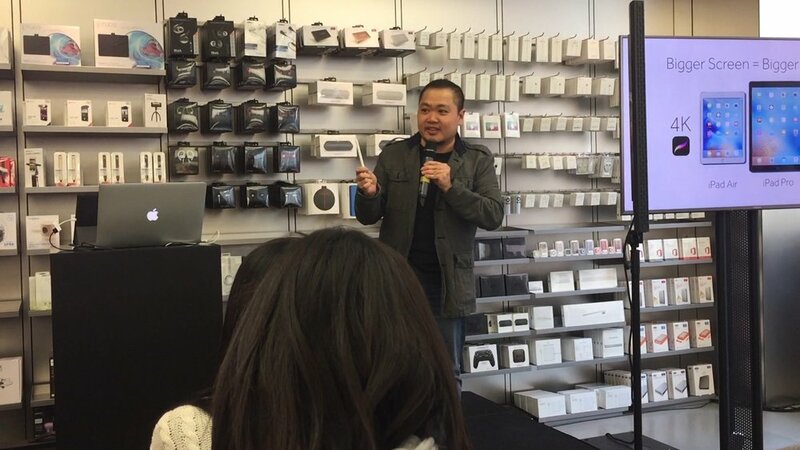 In 2015, Rob was invited by Apple Hong Kong to demo and share his work in conjunction with Apple's global Start Something New campaign. 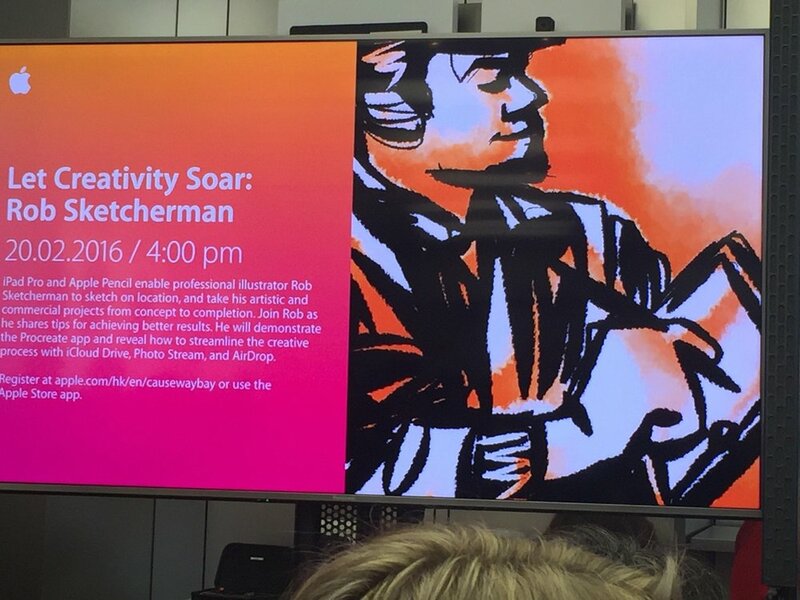 In 2016, Rob was again invited by Apple to demo and speak at an event to share his creative workflow and experiences with commissions as an iPad Artist. 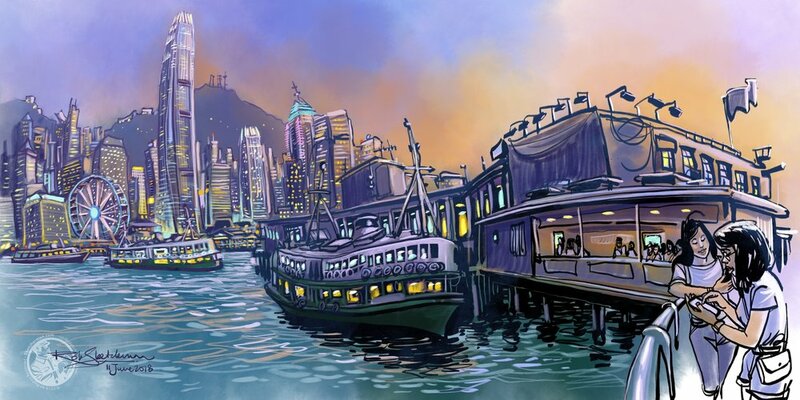 For the past couple of years, Rob has also been invited by Urban Sketchers to run workshops and activities centering around the use of iPads and Procreate for on-location sketching. Rob has also begun offering workshops in schools that wish to explore the many creative uses of an iPad Pro. He shows participants the power of Procreate for artistic expression, as well as how the iPad Pro can replace laptops and desktops for many users. Keen to learn with Rob? Here's the latest in workshop info. Stay tuned for more 2019 workshop announcements soon! Bookings are now open for the Rob Sketcherman Vietnam Retreat! Mountain views, great street food, glamping by a shimmering lake and a 5-star experience to cap the whole trip. That’s the plan in Dalat, Vietnam from 25 Nov- 5 Dec, 2019. Anna Barnes of ArtFoodCulture.com will be your host, taking us to places that are off the tourist trail while sharing her intimate knowledge of the local people and places. Feel safe, excited and free whilst enjoying daily sketching workshops on location with me :) Join us for 11 days and 10 nights for a one-of-a kind iPad Sketching holiday! ArtFoodCulture is an advocate of responsible, ethical, slow and experiential travel. Rob has been selected to join the Urban Sketchers Symposium faculty again in 2019, and will offer a workshop teaching participants how to use iPads and Procreate to draw people; specifically, one of the icons of Amsterdam - cyclists! Embracing the power of Procreate and an iPad with Apple Pencil puts an amazing Mobile Digital Studio in the hands of anyone. This 2-day workshop begins with Rob helping workshop participants comfortably navigate the interface of Procreate. 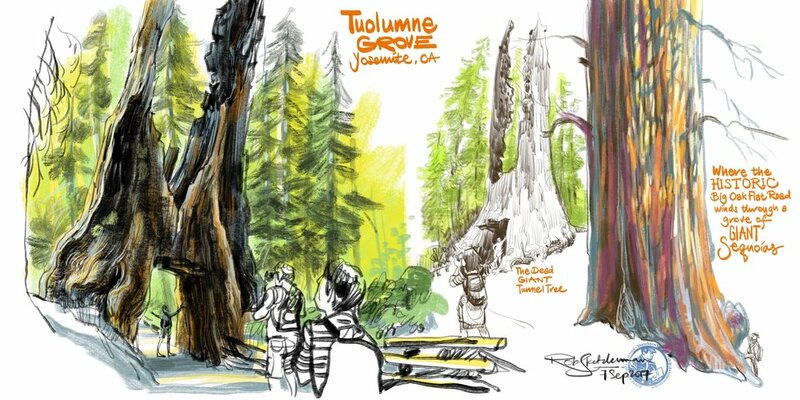 A series of demonstrations and exercises then provide the foundation for students to understand digital workflows and ways to craft urban sketching travel tales whether the family is on a 5 minute bathroom break or enjoying a leisurely afternoon exploring a new city. Are you ready to take your people-drawing to the next level over a weekend? 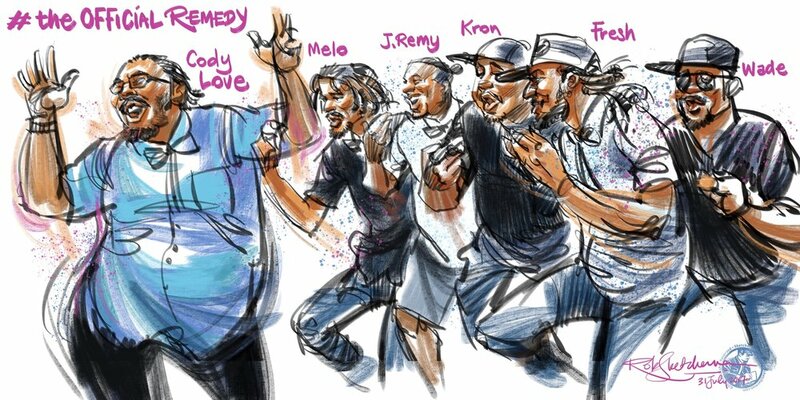 In this 2-day workshop, Rob walks participants through various ways of livening up their sketchbooks with fascinating characters. Learn to nail proportion every time, draw faces and expressions, deal with moving models and even sketch crowded scenes with confidence! Open to practitioners of both traditional and digital tools. 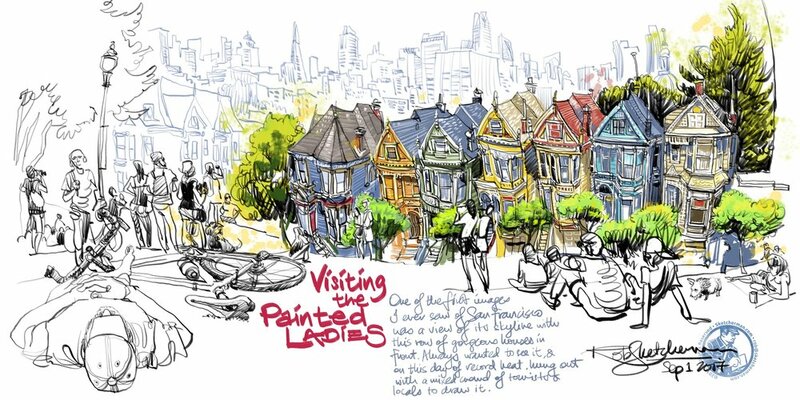 Rob has conducted many workshops internationally, largely centered around his experience with urban sketching using an iPad and the app, Procreate. Here's more information on Rob's workshop schedule, along with details of previous sessions he has conducted. Rob has been invited to collaborate with many brands, and has executed commissions of all kinds, from live-sketching events, creating a celebrity portrait for BMW, and sketching the 39th Hong Kong Film Festival for Moleskine, to designing sets for the stage, and the creation of a multi-story mural for the Madera Hollywood in Central Hong Kong. Browse some of Rob's commissioned works. Central, Hong Kong is one of Rob's favorite spots in the city. This is a scene from the Gage Street market. Here's a selection of artwork by Rob. What's that thing on your iPad? Where did you get it? What else do you use? All answers a click away. Gear guides and sketch adventures.